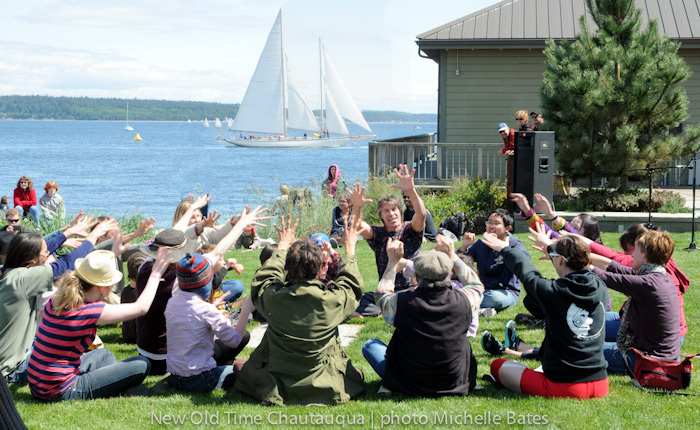 Hello Friends of New Old Time Chautauqua! We're currently gearing up for our next adventure - the 2011 Midnight Sun Vaudeville Tour to Alaska! A bus, truck and van full of Chautauquans [and our gear] will leave on July 15th from Bellingham, trekking north on the Al-Can Highway to bring our blend of education, entertainment and service to 7 different Alaskan communities [see list below]. This is our third trip to the largest state in our 30 year history, this time starting off in Fairbanks on July 21st and ending in Seward on August 9th. Our 50+ multi-generational troupe of volunteers will present community events that feature parades, workshops and vaudeville circus. We will also join local communities and help with their service work, such as building, painting, gardening and environmental projects, so that they can enjoy tangible benefits long after we have departed. We also bring our lively members and shows to people in communities who cannot come to see us – typically those in hospitals, care centers, and correctional facilities. SEE BELOW for how you can SUPPORT OUR WORK! We hope you can join us at the shows, workshops and parades, please spread the word to all your Alaskan friends! Fairbanks - Help in the gardens at Calypso Farm, a non-profit that teaches organic gardening, sustainability and animal husbandry. Chickaloon - Help restore an ancient native trail and landscape the school in this Native American community. Talkeetna - Help tear down walls, paint and landscape at the Folk School, an old church purchased in partnership with the Denali Arts Council as a community location to share skills, knowledge and resources – (learn to knit, build a barn, fix tools etc). Fairbanks - Food Summer Service Program, where kids that are fed in school get meals in the summer. WHAT HAVE WE BEEN UP TO?? 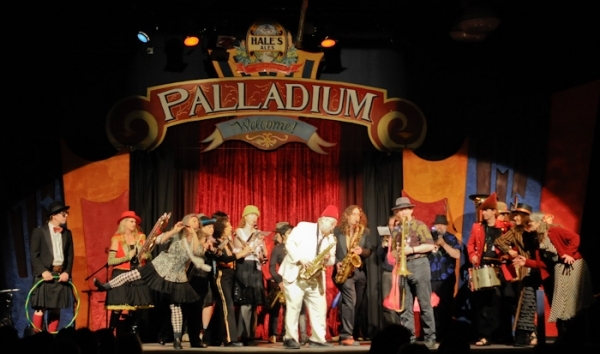 This spring brought Chautauquans from all over together in the Pacific Northwest where we put on a rollicking show at Seattle's 8th Annual Moisture Festival, raising much-needed funds and packing Hale's Palladium. Big thanks to the Moisture Festival for giving us this opportunity to raise community support, and to perform in such a gracious and playful environment. In March, those stalwart vaudeville heroes the Flying Karamazov Brothers put on three (count ‘em, THREE!) benefit shows to support our work. Many thanks to their generous spirits, and to those who came to see the performances in Olympia and Port Townsend. At the end of May, the City of Port Townsend engaged us to come help inaugurate the re-opening of their downtown gem, Pope Marine Park, with a teaser show at the farmer's market, spirited parade down to the waterfront, and lively workshops, culminating in an outdoor vaudeville variety show right at the water’s edge. A big Thank You to the people of Port Townsend, who always show us such generous support. We’re still seeking donations (and counting our loose change) to make this exciting summer tour possible. Please consider a tax-deductible donation from $5 to $5000 or more. Donate through PayPal, and of course, checks may be sent to us at PO Box 70173, Seattle, WA 98127. More information about donations. Our tours run on a shoestring - participants travel on buses, camp in tents and create group meals in our portable kitchen. This way we can bring our particular brand of joy to remote areas free or for very low cost. Community members join our parades, learn to juggle, make masks, sing, do acrobatics, and try many new things in our free workshops. Our performers bring smiles to residents of nursing homes, detention centers, soup kitchens, hospitals … all free. We deliver extraordinary bang for our bucks, but we still need some to keep things rolling. Copyright (C) 2011 New Old Time Chautauqua All rights reserved.